Glaucoma is a common disease that damages the eye’s optic nerve, and glaucoma treatment a condition we commonly treat at our eye clinic in Salem, OR. The optic nerve sends signals from the retina in the back of the eye to the brain which then translates these signals into the images you see. Glaucoma is a leading cause of blindness in those over 60, and is the most frequent cause of nonreversible blindness in African Americans. It is estimated that nearly 2 percent of adults in the U.S. over 40 have Primary Open Angle Glaucoma (the most common form of the disease). Primary open-angle glaucoma (POAG) is defined by progressive damage to the optic nerve with loss of peripheral vision that occurs gradually over time. Some of the known risk factors for the development of this type of glaucoma include increased eye pressure (also known as Intraocular Pressure or IOP), advanced age, racial background, and a family history for the disease. Studies have shown that the prevalence of open angle glaucoma among Caucasians is 3.5 times higher for those in their 70s compared to those in their 40s. Studies have also shown that African Americans are 3-4 times more likely than Caucasians to have open angle glaucoma. Elevated eye pressure is an important risk factor for POAG. Eye pressure is expressed in millimeters of mercury (mmHg), the same unit of measurement used in weather barometers. In the past, “normal” IOP has been defined as about 10-21 mm Hg. However, there are many shortcomings with this definition. Intraocular pressure can vary widely by 10 mm Hg or more during a period of 24 hours. Thus, multiple studies have led us to believe that from 30 to 50 percent of patients who have initial eye pressure tests within a normal range may have open angle glaucoma. Therefore, a single eye pressure test will miss quite a few people who actually suffer from the disease. Additionally, there is a portion of the population who will have open angle glaucoma and never be measured with an elevated pressure. This is called “low tension” or “normal pressure” glaucoma. These individuals may incur optic nerve damage and loss of vision to the same extent as those with “high” eye pressures. Open-angle glaucoma usually has no noticeable symptoms in its early stages and the vision remains normal. Eventually there will be loss of peripheral vision as the optic nerve becomes more damaged. It usually is slowly progressive and painless. Although it usually affects both eyes, it may impact one eye significantly more than the other. Most people won’t be aware of these blank spots in their everyday life until the optic nerve is significantly damaged and these blank spots become large. Blindness occurs if all of the optic nerve fibers die. Thus, glaucoma can steal sight very gradually. However, blindness from glaucoma can often be prevented with early detection and treatment. The American Academy of Ophthalmology now recommends that adults with no signs or risk factors for eye disease get a baseline eye disease screening at age 40. 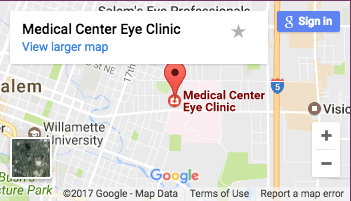 An individual with any of the above mentioned risk factors should plan on having a complete eye exam at our eye clinic in Salem, OR in the immediate future. It is very important that a complete examination, including the optic nerve, be performed to allow for proper diagnosis of glaucoma. That is frightening to know that most people won’t recognize the signs until damage has been done. My family has a history of eye issues, so I want to be extra careful and aware. Getting regular checkups is probably a good idea for me. Now i understood how glaucoma affects our vision. Thanks for this valuable article. This blog is really very informative.